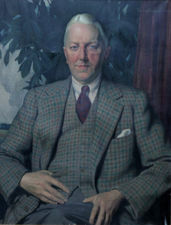 Herbert James Gunn (1893-1964). Glasgow-born Gunn briefly studied art at Glasgow and Edinburgh before moving to the Académie Julian in Paris in 1911. Whilst in Paris, Gunn met William Hutchison who was to be a friend for life. After serving with the 10th Scottish Rifles in the First World War, Gunn returned to Scotland where he married twice within a decade. His second wife, Pauline Miller, became a model for some of his best-known paintings. In 1929 Gunn decided to devote himself to portraiture and soon established a prolific and successful career. His portraits are sometimes sombre but always carefully painted, with close attention to detail. His distinguished sitters include Queen Elizabeth, Prince Philip and the Queen Mother.